Happy Handmade Holiday Sale & Deals! There is a lot going on for everyone at this time of year , so let’s keep this short & sweet. 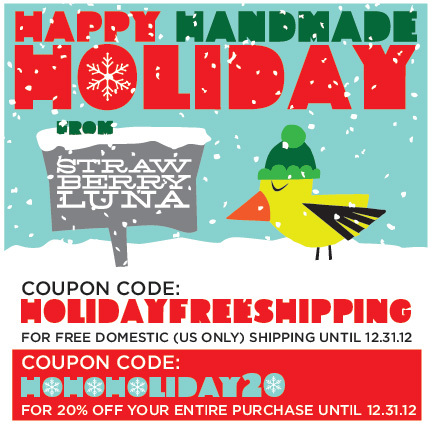 HOHOHOLIDAY20 – For 20% off of any order, shipped anywhere in the world! HOLIDAYFREESHIP – For free Priority USPS Shipping anywhere in the US (only). 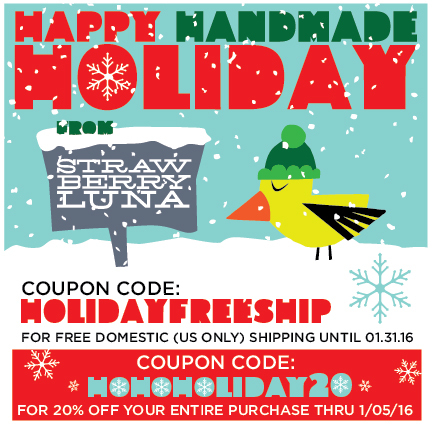 Our annual Happy Handmade Holidays Sale and Coupon Codes are good through January 31, 2016! And both Coupon Codes are valid in our Webshop here and in our Etsy Shop here as well. So you can treat your friends, family and even yes, yourself. You’ve been good. You deserve it too. We are shipping every day with joy from our studio right to you until Christmas Eve, December 24th. For USPS Christmas Delivery Dates, click here. And for expedited shipping rate quotes email us! We’re happy to make holiday magic with you. When you shop with small businesses, handmade makers, and American made artisans your purchases make a direct impact on many lives. For instance, in our case, when you shop with us, we then also support other small, local businesses. How? We source our materials from US-based and US-manufacturing producers & distributors for our papers (like Domtar Cougar and French Paper), inks ( we use mainly Speedball), screens, squeeges, output films (all from Pittsburgh’s own Tech Support Screenprinting Supplies) and more. We also wholesale our art work to many independent shops (local favorites Wildcard in Lawrenceville and Sapling & Sons in Beaver, PA) around the country who do more of the same and support more small businesses in turn. We think it’s a pretty great cycle; we hope that you do too. Best & brightest! Happy Holidays to all! 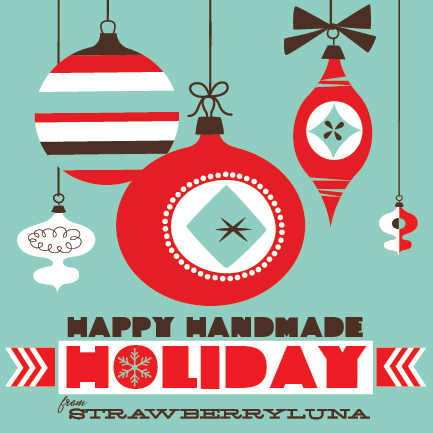 Happy Handmade Holidays Coupon Code Deals from strawberryluna! Ho Ho Ho! And Happy Holidays! This year, we’re offering TWO super easy holiday deals to help make your holidays easy, bright and full of hand printed & handmade goodness. FREE Domestic (US-only) Shipping on your orders. Just use Coupon Code HOLIDAYFREESHIPPING during checkout. Or get 20% off of your entire order! Just use Coupon Code HOHOHOLIDAY20 during checkout. All Coupon Codes are good through 12/31 and are usable as often as you’d like. 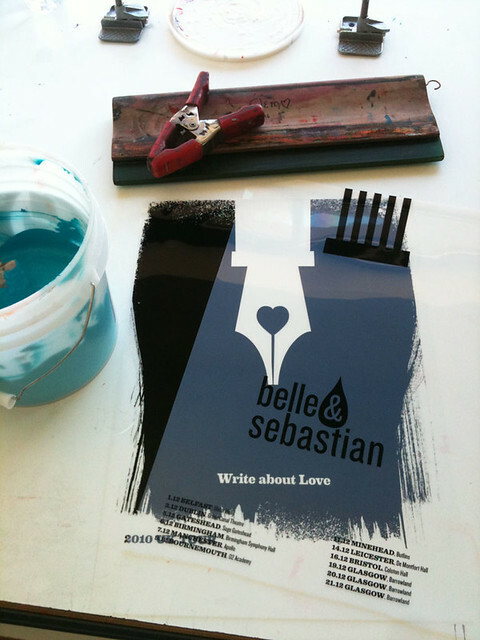 So go for it – make your holiday gift giving a bit extra special this year and gift Handmade, hand printed art and gifts. Print Sets – Make gifting easy! But most of all, we hope that your holidays and happy and bright this year. Peace on Earth. Goodwell towards all. Cheers! Come take a walk with your new BFF in The Dragon’s Forest. 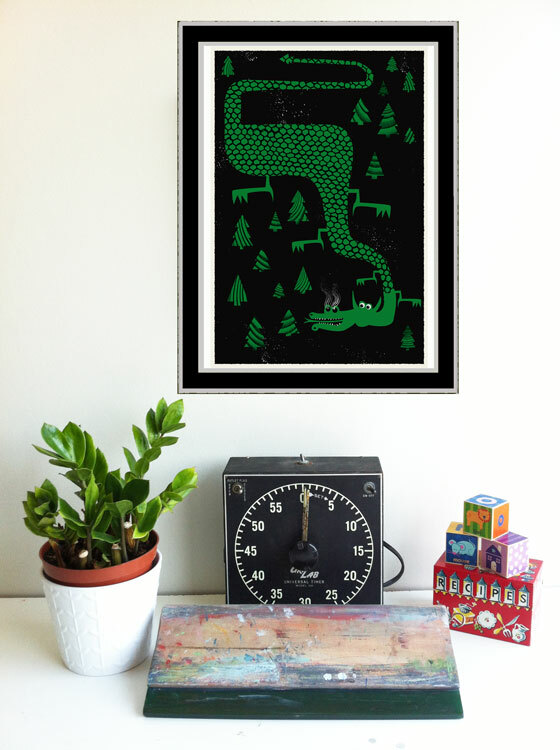 Breathing smoke and curling up around his favorite trees, this Dragon can’t wait to come over and hang out. 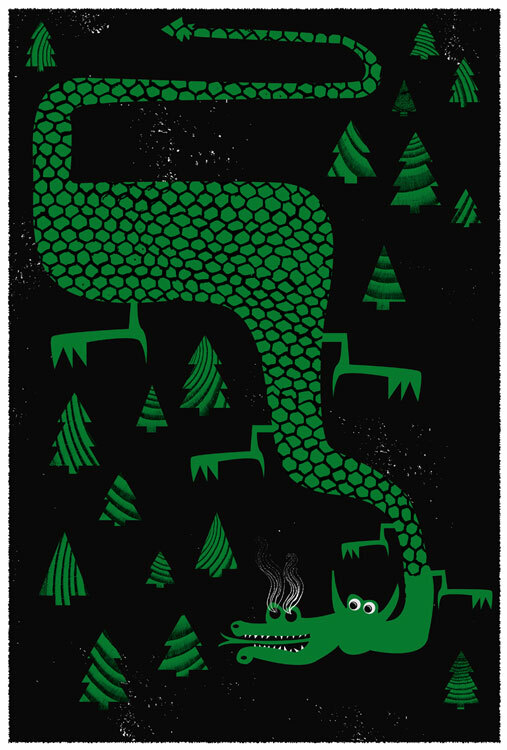 This is our new limited edition screenprint, hand pulled by us here in Pittsburgh, The Dragon’s Forest is a 2 color silkscreen art print based is on our poster created exclusively for Jackie Kashian’s awesome podcast The Dork Forest live show at CONvergence in July 2012. 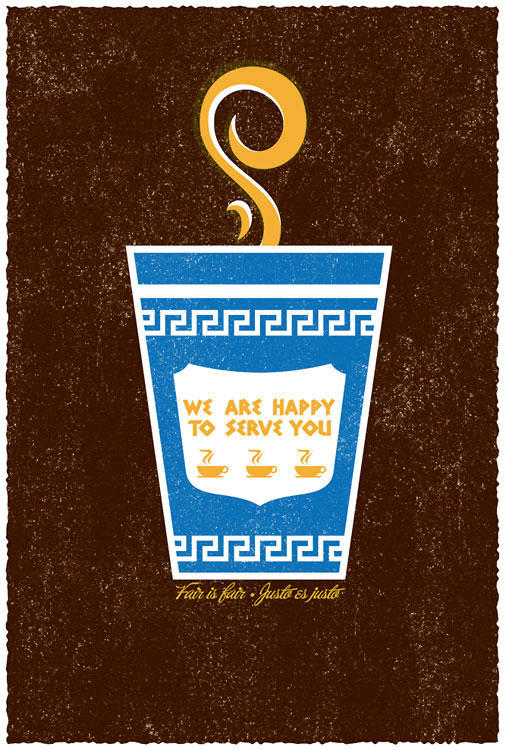 This art print is now freshly available in our webshop here and also in our Etsy shop here. Inks: 2 colors with hand-mixed dragon scales green and midnight black non-toxic water based silkscreen inks. Edition: Limited edition of 200. 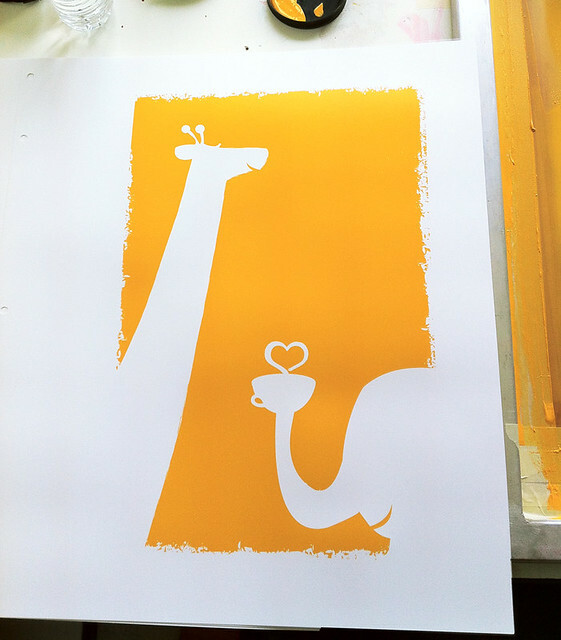 Each print is hand signed and numbered by strawberryluna. Size: 16 x22 inches (45.7 cm x 61 cm). Paper: Archival, no-acid, recycled content, American made Cougar Opaque White, 100lb cover weight. Fits beautifully into either a standard 16″ x 20″ frame by trimming the border, or into an 18″ x 24″ frame (as below) as is with a matte. strawberryluna debuts at NYIGF Booth #5305! Hello Next Level, pleased to meet you! We’re thrilled to announce the strawberryluna debut at the incredible New York International Gift Fair this August 18-21, at Booth #5305 in the revamped New York’s Newest section, now back inside Javits Center in Hall 1E. Now even easier to visit and find! We will have a curated selection of Art Prints, our beloved hand silkscreen printed Alphabet Prints and our Lunch Bear Lunch Bags on display for retailers, editors, and press alike. With plenty of beautiful new catalogs, line sheets, wholesale terms and fresh info cards in hand, we’re excited to begin this new venture at NYIGF and talk with new accounts and clients. 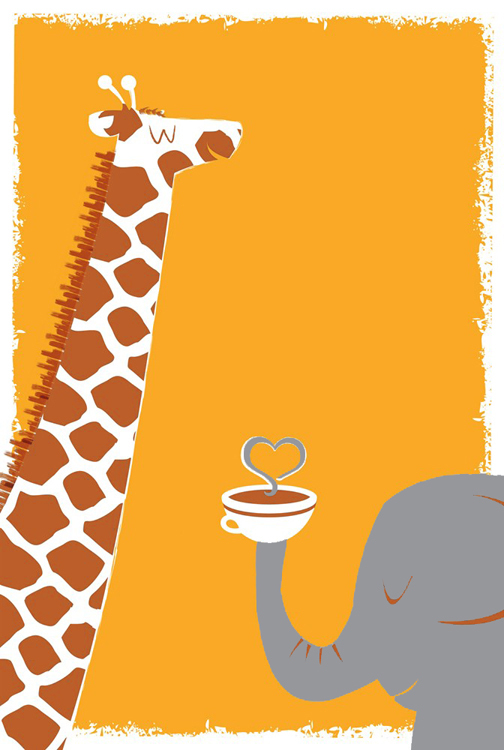 Named one of the Key Exhibitors by the NYIGF, we at strawberryluna can’t wait for the show to begin next Saturday, August 18th. Check out our sample products and 2 show specials below. Hope to see you there! strawberryluna, Booth 5305 Hall 1E, New York’s Newest at the New York International Gift Fair. August 18-21, 2012. Show Special 1: FREE SHIPPING on all pre-paid orders placed on-site at the show. Show Special 2: Any 3 Alphabets of your choosing, FREE with every $500+ order. 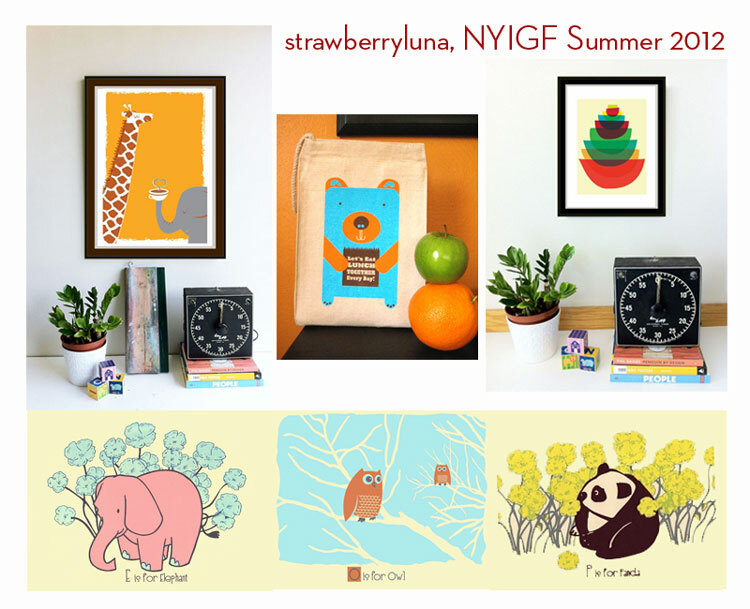 strawberryluna will be at Booth #5305 in Hall 1E, New York’s Newest at the New York International Gift Fair this August 18-21, 2012. We hope that you’ll be there too! One Solid Gold Toof & and a Gold Record – it’s all good. 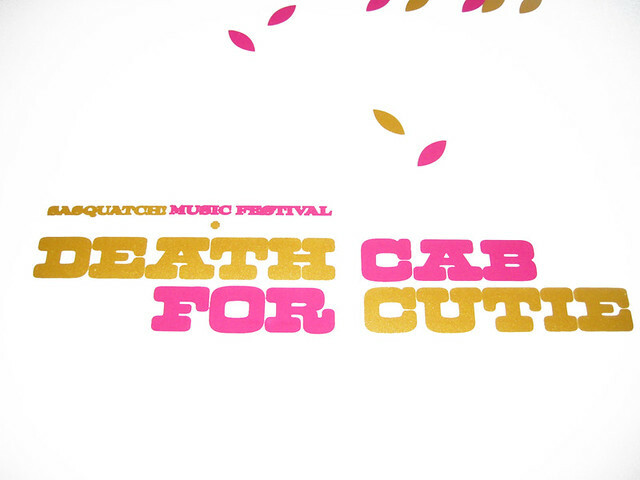 We’re really honored to be a part of the amazing Sasquatch! 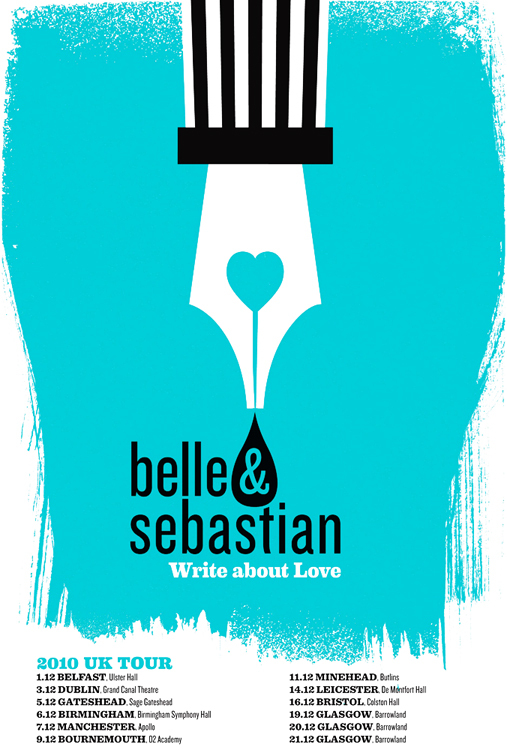 Festival Poster Invitational for the 5th year in row. Each year Sasquatch! Fest hand picks a group of current poster artists from around the world to produce one special, limited edition posters for one of the bands playing at the Festival that year. 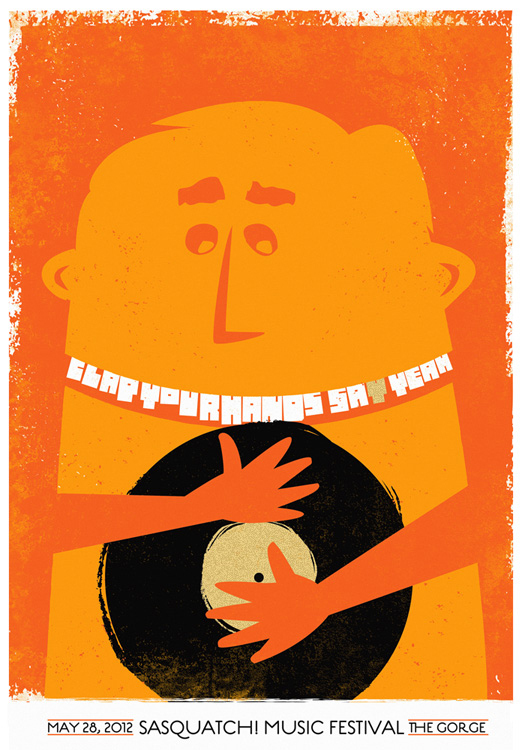 For 2012 we are lucky enough to paired up with the super Clap Your hands Say Yeah and we couldn’t be more pleased. 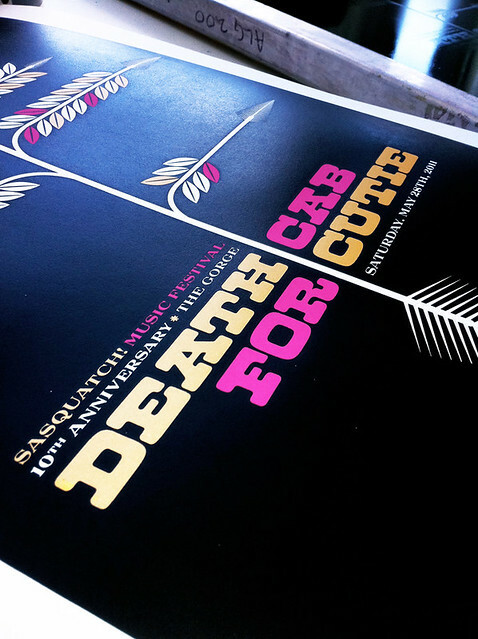 This year’s 2012 poster gallery is up at the Sasquatch! site here. Our new poster for them is now available in our Web Shop here and also in our Etsy store right here. 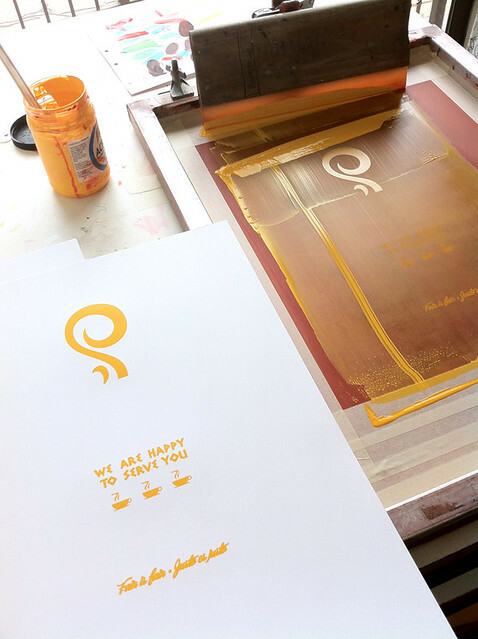 Our Clap Your Hands Say Yeah poster is an all hand pulled, hand screen printed gig poster with 4 colors, one of them is a metallic gold that shimmers like crazy in the light. 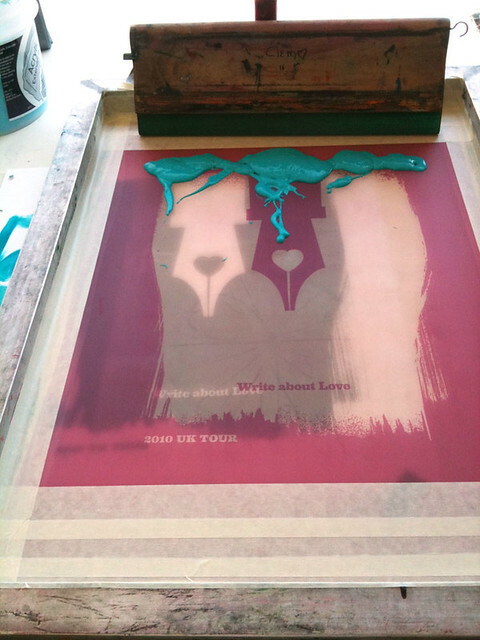 Painstakingly silkscreen printed by hand in our studio. Limited edition of 120. This run was split into 3, a portion for the band, another portion went to Sasquatch! 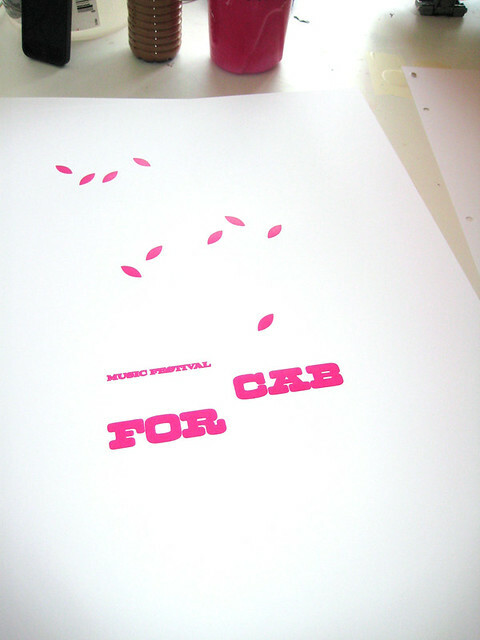 Fest for their annual Poster Show in conjunction with the festival, with the remaining posters available here. 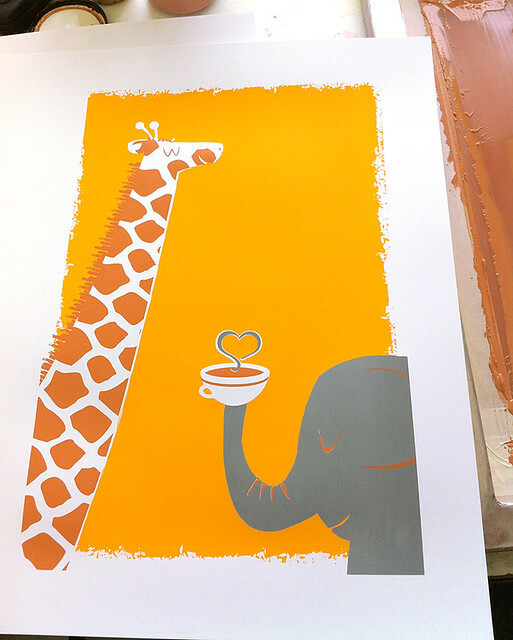 Each print is hand signed and numbered by strawberryluna. Size is approximately 16 x22 inches (45.7 cm x 61 cm). Printed on archival, no-acid, recycled content, American made Cougar Opaque White, 100lb cover weight. Fits beautifully into either a standard 16″ x 20″ frame by trimming the border, or into an 18″ x 24″ frame as is with a matte. 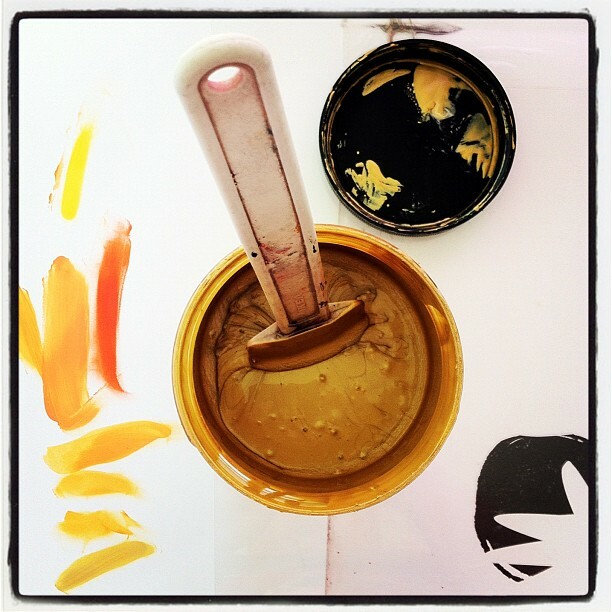 The additional photos that you see below were taken during the hand silkscreen printing process. 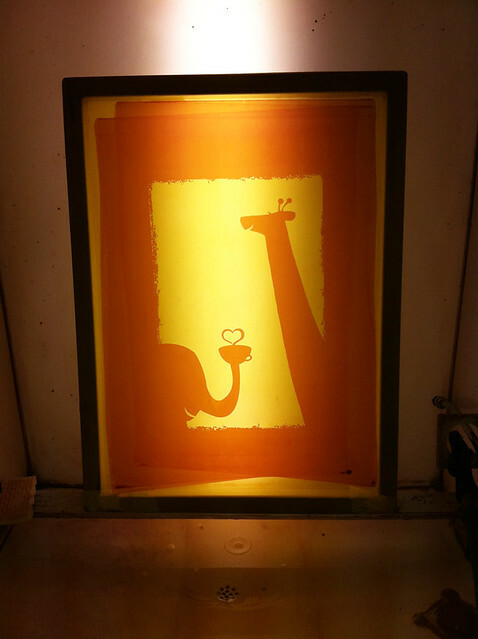 For more info and more photographs hop over to our Flickr account & hand silkscreen printing process set here. To purchase this, or any other prints and posters, head over to our Web Shop here! 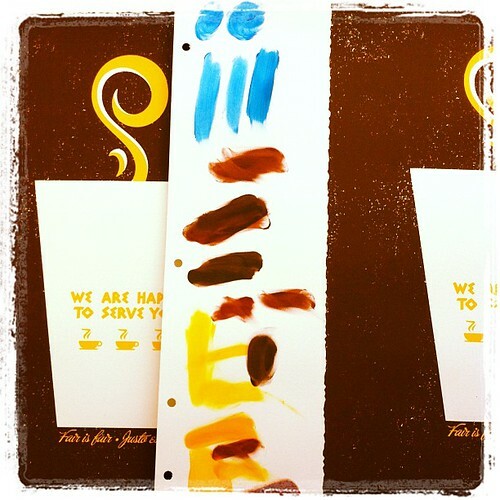 Lovely and shimmering metallic gold ink and color test-smears on the left. Soon to be a record…and a tooth! 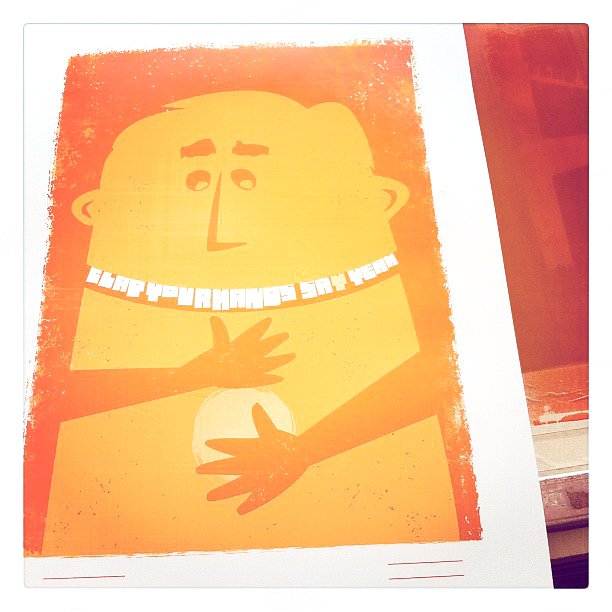 2nd color, the background orange, printed onto my “registration copy”, hence the color test smears on the side. Ignore those! The registration copy is the only copy that ever has markings like this. 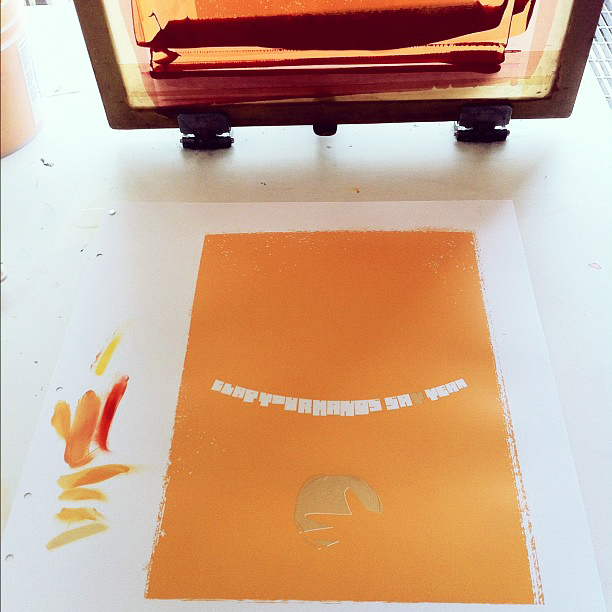 The 2nd & lighter orange ink at the top of the screen, about to be printed for the 1st time. 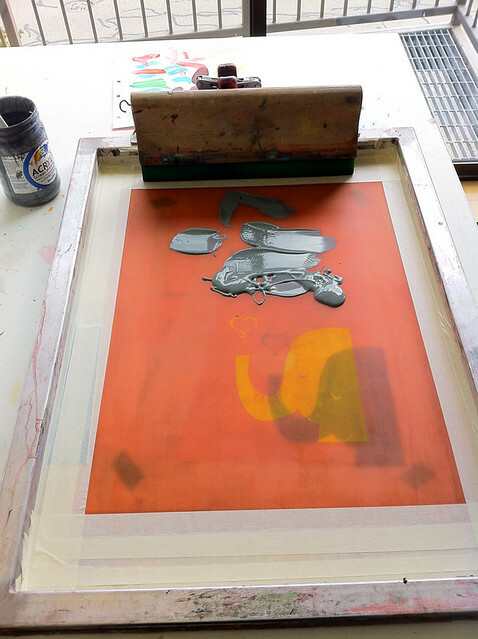 The 2nd and lighter orange ink at the top of the screen, about to be printed for the first time. All done! 4th and final layer printed in midnight black ink. Our Fab.com sale starts TODAY! Click to visit our Fab.com sale! We’re having a new sale on Fab.com! Our sale starts today Wednesday 3/21 at 11am and runs through Monday 3/26. 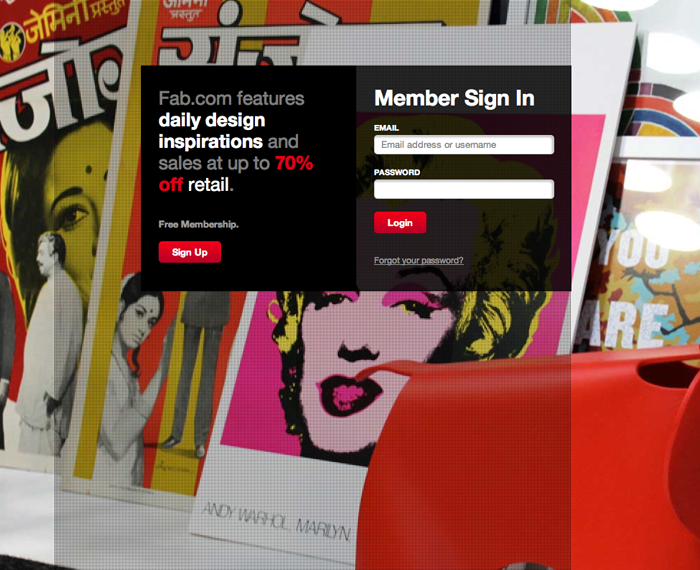 For 5 lightning quick days we’ll be featured on the amazing design-centric, membership only Fab.com. Membership at Fab.com is 100% FREE. Use this handy sign up link if you aren’t already a member! We are, because we’re not just sellers at Fab.com. we’re also buyers. Seriously! With special discounts to Fab.com members of 30% – 40% off of our day-to-day retail, there will be tons of great deals will be available on our hand silkscreen printed art prints, super soft tees for adults and infants will be available for just 120 hours. But only to Fab.com members. Fab.com is a member-only, extremely well curated design+art shopping site featuring flash sales of 120-hour duration with special deals, available exclusively at Fab.com. Not already a member? Why not silly, it’s FREE! To get a your free Fab.com account use this invite link and see what the fuss is about. Don’t forget, our sale runs for just 120 hours and starts TODAY Wednesday 3/21 and ends Monday 3/26, and once the sale is over, done, and gone….BOOM! It’s gone forever. 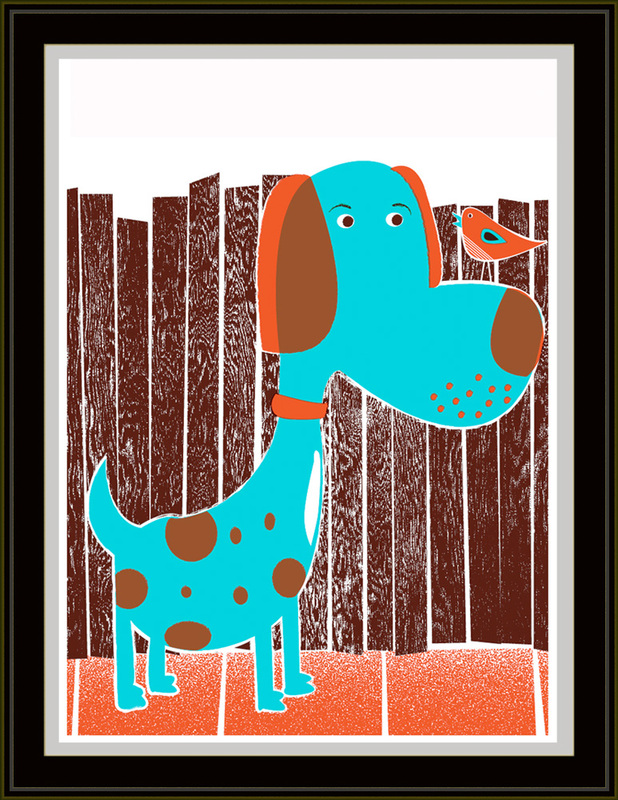 Bird Dog & Bird, our new 4-color hand screen printed art print. And if you are lucky, it’s right in front of you. 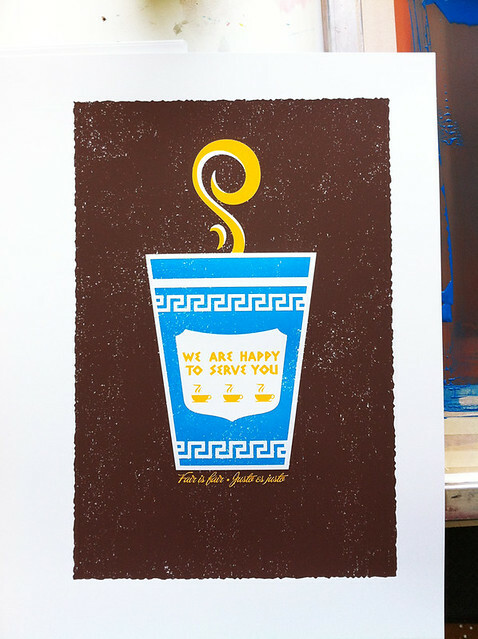 Bird Dog & Bird is our newest, all hand silkscreen printed art print of just such an instant. And why couldn’t these two be the best of friends? Stranger things have happened! 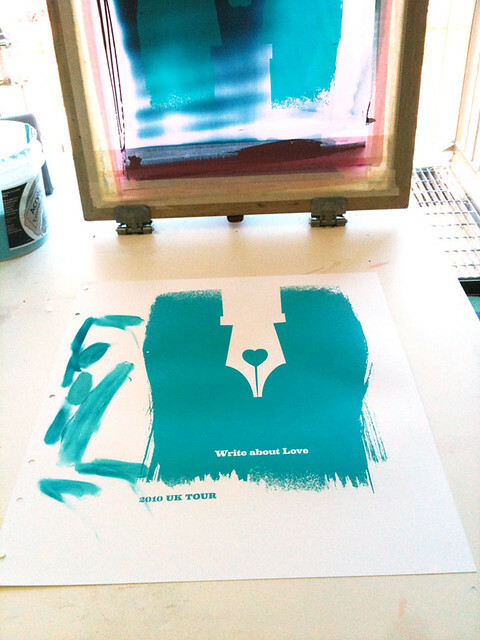 Hand pulled screen print. 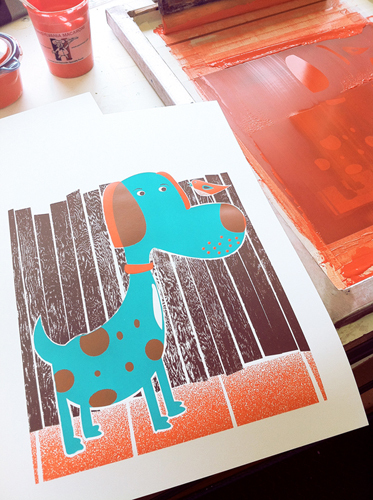 4 colors from 3 screens with bright teal hound dog blue, warm and transparent burnt orange and cocoa brown water based silkscreen non-toxic inks. Edition of 105, hand signed, titled and numbered. Printed onto archival, no-acid, recycled content, American made Cougar Opaque White, 100lb cover weight. This print fits beautifully into either a standard 16″ x 20″ frame (as shown above), or into an 18″ x 24″ frame with a matte. “Bird Dog & Bird” is now available in my Etsy shop here, and…soon to be available in my new website & webstore! OMG! 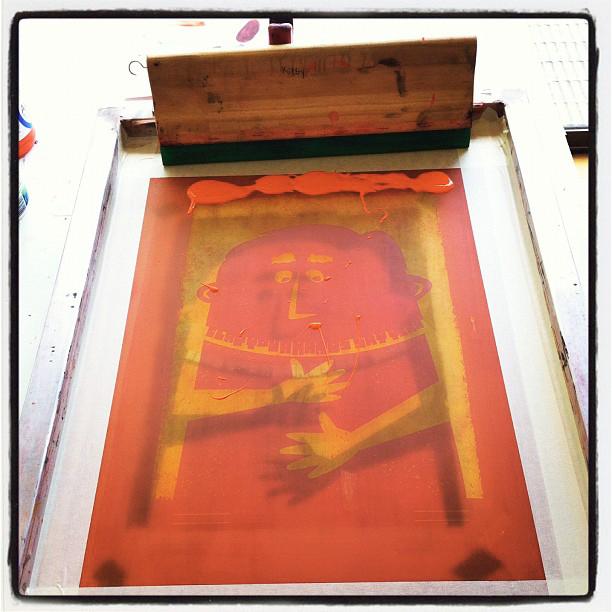 Check out some photographs from the hand screen printing process of this print below. To see more process photos, visit my Flickr account. 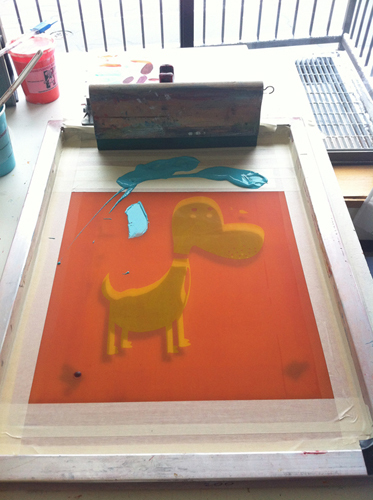 Getting ready to print the first color, “Bird Dog & Bird” screen print. 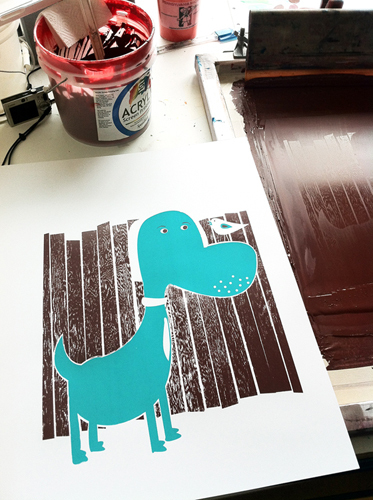 1st color on our “Bird Dog & Bird” silkscreen art print. 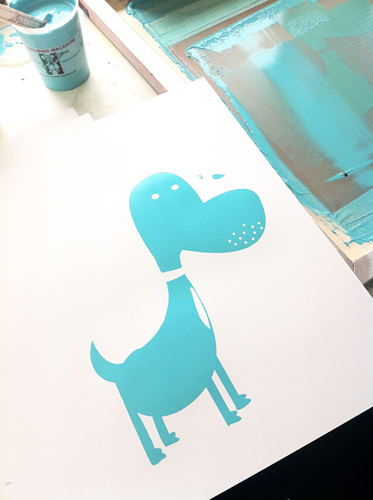 2nd color on our “Bird Dog & Bird” silkscreen art print. 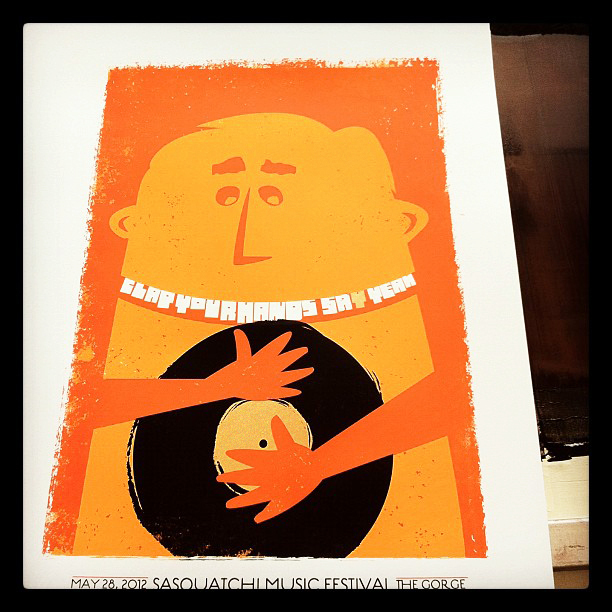 3rd & final color on our “Bird Dog & Bird” silkscreen art print. All done! Flatstock 33, SXSW, movie premiere & HGTV poster news! 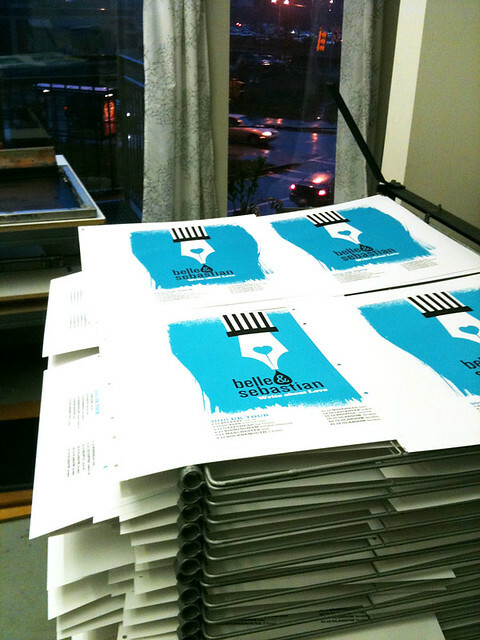 The very first Flatstock Rock Poster Convention of 2012 is right around the corner and we’re getting all of our posters, prints, tees, test prints and thingamajigs into gear. We’re chomping at the bit and rarin’ to go with lots of new work to show at first taste of Spring and favorite Texas town during the amazing SXSW Music Festival. Flatstock 33 will display the works of more than 100 artists from across North America and the globe. The exhibition is free and open-to-the-public running March 14-17 and features posters representing decades of styles, colors and techniques for sale. Show up early and be ready to be overwhelmed with amazing posters. (You might want to bring some dough since you won’t want to leave empty handed!) The exhibition is free and open to the public. This year is just slightly more exciting than ever with a couple of added events in Texas. 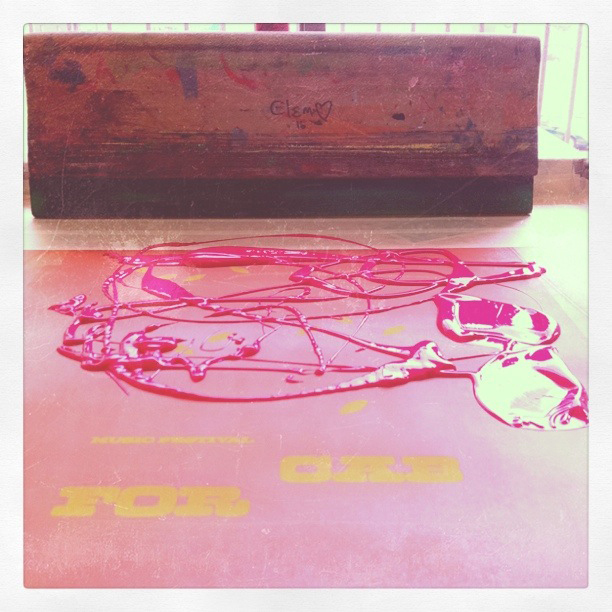 Wednesday 3/14: Hot gig poster printing awesomeness! We were commissioned by the HGTV network to design a poster for one of 4 showcase nights of great music they will be hosting at SXSW at their beautifully renovated venue, The Studio. Our silkscreen poster (see the design below) will be hand printed on-site by Andy MacDougall of Squeegeeville with the help of Austin’s own Coronado Studio during the opening night of The Studio on Wednesday 3/14 and we’ll be there too, signing posters and they are completed and handing them out to the first 300 folks at the show. 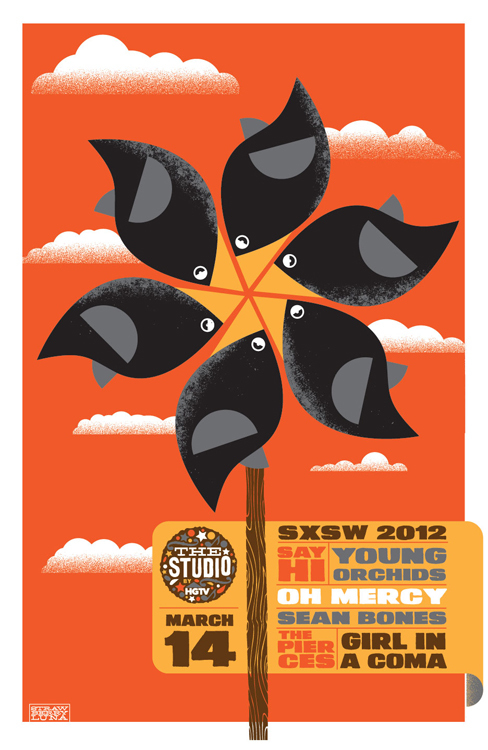 (Note, you must be a registered SXSW participant to attend The Studio showcase shows.) The bands appearing for Wednesday night’s showcase are: Say Hi, Young Orchids, Oh Mercy, Sean Bones, The Pierces & Girl In A Coma. For more info about HGTV’s The Studio, full band and poster artist list click here. This limited edition, hand silkscreen printed poster will be available exclusively at The Studio by HGTV on 3/14 during the show. Thursday 3/15: We will be appearing at the SXSW Film Festival Premiere of the poster documentary film Just Like Being There by director Scout Shannon on March 15th at 4:15pm at The Vimeo Theater (inside the Convention Center at 201 Trinity St.) and Allison will be speaking after the Premiere in a Q & A session with a selection of other Flatstock posters artists who also appear in the film. Who: Over 100 working rock poster artists from all around the globe. Click here for the list of Flatstock 33 participating artists. Where: Flatstock 33 at SXSW in the Austin Convention Center on Level 1 – Ballrooms A, B, C – same place as last year! What: The FLATSTOCK poster show series is presented by the American Poster Institute (API). 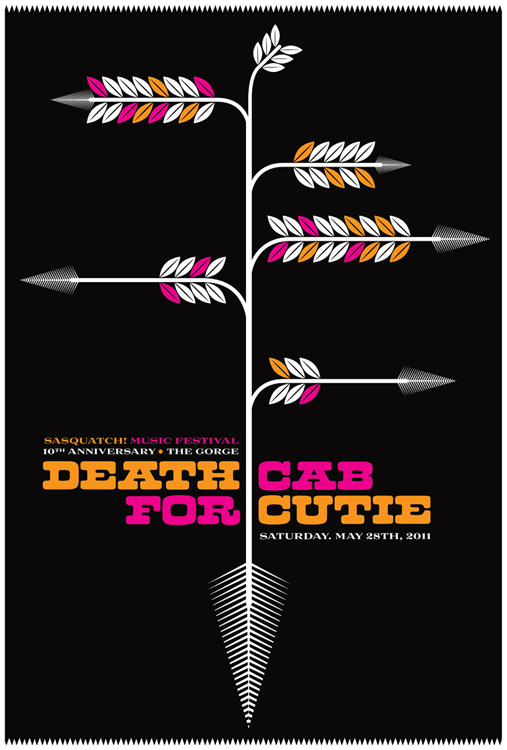 It is an ongoing series of exhibitions featuring the work of many of the most popular concert poster artists working today and happens 4-6 times a year with scheduled shows in Austin, TX at SXSW, Barcelona Spain during Primavera Music Festival, Chicago, IL during Pitchfork Music Festival, Seattle WA at Bumbershoot Fest, and in Hamburg Germany during the Reeperbahn Festival. If you are in Austin for SXSW we hope to see you at the amazing Flatstock Rock Poster Convention, so come say hello! Flatstock 29, SXSW Festival & Austin, TX here we come! All of the Flatstock 29 identity designed by exclusively us at strawberryluna this year! Around these parts? Mid-March means the opening of carnie season when we start our new year of shows. And it’s super exciting to always get to break out of the evergrey of a long long Pittsburgh winter (ummm, it snowed this past weekend. I mean, come on!) with our first trip and show of the year to sunny, warm and awesome Austin, TX. We’ll also have a HUGE slew of Test Prints that I’ve been working on for a top-secret project (but details will be coming soon) for early next year. In the meantime, hopefully some of your will enjoy the current crop of them. ‘Cause Cousin? We got a bunch for ya. What is Flatstock? It’s over 75-100 currently working poster artists coming to show their talents, display and sell their work and talk with new people about what we do and why. And yep, hire us! And yes, Flatstock Austin is FREE to attend and open to the public! The very first Flatstock Poster Convention of the year will once again be held in Austin, Texas during the SXSW Festival. This is our 29th Flatstock to date, and the Austin Flatstock is always FREE to attend & definitely wide open to the public. We are in a new room this year, so check below for a convenient map to help you find over 75 poster artists from around the world displaying & selling their rock posters. Hope to see you there! You DO NOT need to have badges to be able to attend Flatstock 29. It’s FREE & open to the public! For more info on Flatstock 29 & the SXSW Festival click here. “The FLATSTOCK poster show series is presented by the American Poster Institute (API). It is an ongoing series of exhibitions featuring the work of many of the most popular concert poster artists working today. The API is a nonprofit corporation dedicated to serving poster artists and promoting the art form. 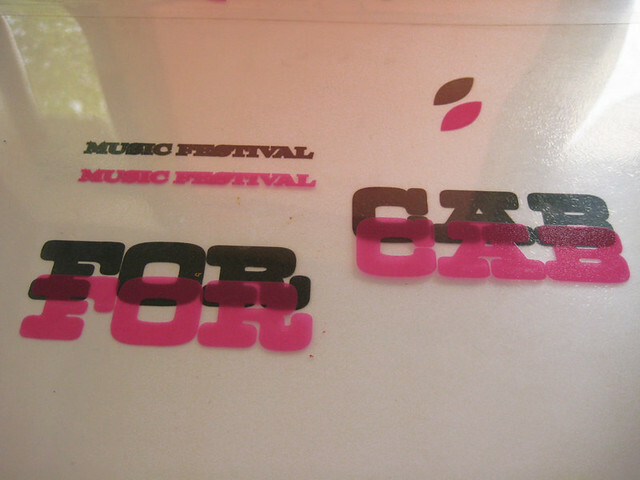 Both the API and its FLATSTOCK series were organized in 2002 as a result of conversations between interested artists and supporters frequenting the popular website GigPosters.com. The best concert posters have always captured both the essence of the music they promoted and the spirit of the time in which they were produced. This is as true today as it was in San Francisco during the Sixties. Click to see a larger map.